Peter BORGEN, Kare FUGLSETH, Roald SKARSTEN, The Philo Index. A complete Greek world index to the writings of Philo of Alexandria, Grand Rapids : Eerdmans, 2000. 28 cm. 371 p. ISBN 0-8028-3883-9. $ 55. Paul HOFFMANN, Thomas HIEKE, Ulrich BAUER, A Greek Concordance to the first three Gospels in synoptic arrangement, statistically evaluated, including occurrences in Acts. Vol. 1, Berlin : Walter de Gruyter, 1999, 32 cm. 1032 p. ISBN 3-11-016296-2. $ 298. 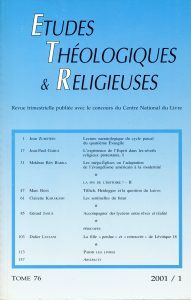 G. VAN BELLE, Index Generalis ETL/BETL 1982-1997, (BEThL 134), Leuven : University Press, 1999. 25 cm. 337 p. ISBN 90-6186-992-7. Florentino GARCIA-MARTINEZ, Eibert J.C. TIGGHELAAR, The Dead Sea Scrolls. Study Edition, 2 vol., Leiden/Grand Rapids : Brill/Eerdmans, 2000. 24 cm. 1361 p. ISBN 90-04-11547-1/ISBN 0-8028-4493-6. $ 100. Albert SCHWEITZEER, The Quest of the Historical Jesus. First complete Edition, London : SCM Press, 2000. 24 cm. 562 p. ISBN 0-334-02791-8. £ 30. Margaret DALY-DENTON, David in the Fourth Gospel. The Johannine reception of the Psalms, (Arbeiten zur Geschichte des antiken Judentums und des Urchristentums XLVII), Leiden/Boston/Köln : Brill, 2000. 24 cm. 375 p. ISBN 90-04-11448-3. Fl. 200,54/$ 112. Jerry L. SUMNEY, ‘Servants of Satan’, ‘False Brothers’ and other opponents of Paul, (JSNTS 188), Sheffield : Academic Press, 1999. 24 cm. 355 p. ISBN 1-84127-060-1. £ 50/$ 85. Kent L. YINGER, Paul, Judaism, and judgment according to Deeds, (SNTS MS 105), Cambridge : University Press, 1999. 22 cm. 318 p. ISBN 0-21-63243-9. £ 40/$ 64,65. Wendy DABOURNE, Purpose and cause in Pauline exegesis. Romans 1.16-4.25 and a new approach to the letters, (SNTS MS 104), Cambridge : University Press, 1999. 221 cm. 257 p. ISBN 0-521-64003-2. £ 37,50/$ 59,95. Mark REASONER, The Strong and the Weak. Romans 14.1-15.13 in context, (SNTS MS 103), Cambridge : University Press, 1999. 22 cm. 272 p. ISBN 0-521-63334-6. £ 37,50/$59,95. Simon LÉGASSE, L’épître de Paul aux Galates, (LD Commentaire 9), Paris : Cerf, 2000. 22 cm. 496 p. ISBN 2-204-06417-3. FF 275. Bruce CHILTON, Craig A. EVANS (éd. ), James the Just & christian origins, (Suppl. to Novum Testamentum 98), Leiden/Boston/Köln : Brill, 1999. 25 cm. 299 p. ISBN 90-04-11550-1. $ 67. Wesley Hiram WACHOB, The Voice of Jesus in the social rhetoric of James, (SNTS MS 106), Cambridge : University Press, 2000. 22 cm. 251 p. ISBN 0-521-66069-6. John M. COURT, The Book of revelation and the Johannine apocalyptic tradition, (JNSTS 190), Sheffield : Academic Press, 2000. 24 cm. 181 p. ISBN 1-84127-073-3. £ 37/$ 59.